It was a full house — literally — at the San Francisco home immortalized by the famous eponymous 80's sitcom. The Tanners on Friday flocked to the Lower Pacific Heights home where they "lived." The classic Victorian home was bought — fittingly — by "Full House" creator Jeff Franklin. Talk about full circle! Cast members, including Candace Cameron-Bure, Andrea Barber, Bob Saget, Jodie Sweetin and Dave Coulier, celebrated Franklin's purchase of the property at 1709 Broderick Street. "We just came down to take a picture of the house and it was so random that everything was happening," said tourist Ikram Kamal. Fellow visitor Emily Le agreed. “I think it’s awesome that they’re coming out for the fans and want to be here for their supporters and are actually here interacting with their fans as real people. I think it's something that a lot of people don’t get to do. So it’s really cool that they’re doing that," she said. The iconic home had been on the market since May at a price tag of $4.15 million. The house's exterior, then painted white, was used as the Tanner family's residence in the original show. Franklin paid about $4 million for the 2,985-square-foot house, which features three bedrooms and 3.5 bathrooms. One of the first things he said he did after buying the property was have its front door painted red — as a throwback to the hit TV show, according to The Hollywood Reporter. The previous homeowners had opted to paint it a seafoam green. 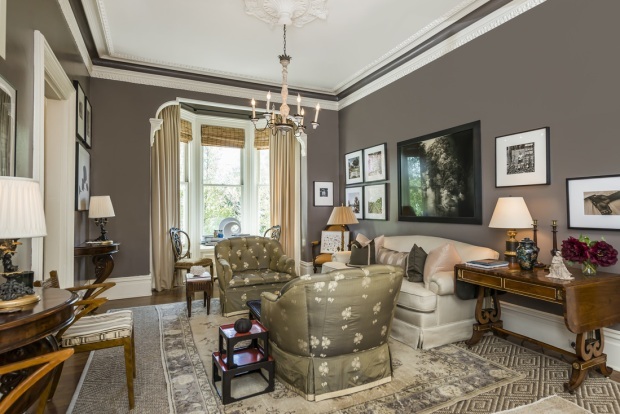 A listing on the Vanguard Properties website says the Charles Lewis Hinkel home was constructed in 1883 and is one of the city's finest examples of preserved Italianate, Victorian architecture. However, that means the house is something of a fixer-upper. "We have to seismically retrofit it, redo the foundation, electrical, plumbing —that’s going to take awhile," Franklin said. The restoration will also include five freshly imprinted and signed blocks of concrete. Franklin is also laying the foundation for the "Full House" reboot — dubbed "Fuller House." Season two will be out on Netflix on Dec. 9. “We want to come back here to shoot some new footage, some stock shots, do a scene leaving the house — I don’t know, exactly," Franklin said. Franklin says he will likely rent the house after renovating it. Finding tenants in this housing-challenged city won’t be hard, he surmised. "Full House" premiered on Sept. 22, 1987 so Sept. 22, 2017 will mark the show's 30th anniversary. "That will be around the time that all of my construction will be done, so I hope to bring the cast up to the house and have a big slumber party here so people can drive by and actually see the Tanner family living there for one whole day," Franklin told The Hollywood Reporter. "That would be pretty fun."